Royal Mail has launched a new set of stamps to celebrate the Royal Society's 350th anniversary. 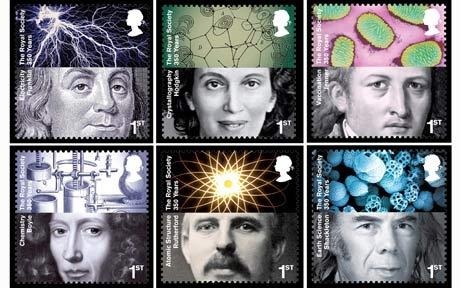 The set of 10 stamps show some famous figures from the world's oldest science academy. 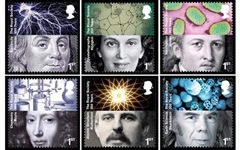 They include Sir Isaac Newton, physicist and optical pioneer; Benjamin Franklin, inventor of the lightning conductor; Edward Jenner, inventor of vaccination; Charles Babbage, developer of programmable computers; Alfred Russel Wallace, pioneer of evolution theory; Joseph Lister, inventor of antiseptic surgery; Ernest Rutherford, founding father of nuclear physics; Dorothy Hodgkin, inventor of x-ray crystallography; and Sir Nicholas Shackleton, pioneer of climate research. Adverse weather conditions are currently causing delays to mail sent within the USA. The conditions are local to our US based printing station and so will affect all mail sent to the USA from mid day on Friday the 5th of February. Mail will be sent to the postal service as soon as conditions return to normal but customers should expect delays. If you looking for an interesting day out then you might want to check out the Tropical Extravaganza festival being held at Kew Gardens. The festival in being help in the Princess Wales Conservatory and runs for a month. It features hundreds of varieties of orchids, bromeliads and anthuriums and has taken around a year to prepare. It runs from Saturday 6 February to Sunday 7 March.